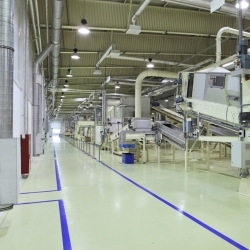 A user friendly and easy to apply water-based 2 component epoxy floor coating with an ultimate adhesion and durability. The product has an excellent wear, impact and abrasion resistance like foot and vehicle traffic. 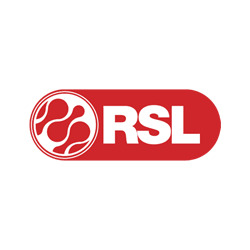 Resists chemicals and standing water. The product can be applied on concrete floors, which are completely clean and dry. It is not recommended to apply on smooth/dense concrete or concrete containing a curing compound, which will prevent a good adhesion. Can also be applied on old good adhering coatings. Epoxyshield Decorative Chips (505.0.43) are specially designed for use in combination with Epoxyshield 5300 MAXX. The chips adhere permanently on the floor when they are sprinkled in the wet coating. They give a decorative finish and will also mask dirt and rugosity. Pour the contents of A into B and stir thoroughly for at least 3 minutes. Allow mixed product to stand (see table) before rolling the coating on to the surface. Do not leave container in direct sunlight. Mix again before applying. The product must be used within 1 to 2 hours of initial mixing (pot life, see table). This time decreases at higher temperatures. Do not mix Paint Chips with Epoxyshield 5300 MAXX. Apply when air (ambient) temperature is 15-35ºC and relative humidity is below 80%. Concrete floors take a long time to warm up; make sure the previous day has also been at least 15ºC prior to painting. Minimum floor temperature for painting is 13ºC. Painting in mid afternoon ensures the best cure. Decorative Chips can easily be scattered on the freshly coated surface. Maintain a wet edge to prevent lap marks and gloss differences. Sprinkle the decorative paint chips onto the wet film (note: this step may be skipped if chips are not desired. This will not affect the performance of the coating). Immediately continue to coat the next section (note: fresh paint can be applied over the loose chips that lay outside the previously painted area). Only one coat is necessary. Wash all tools and equipment immediately with warm water and mild detergent. Allow any unused product to harden in the container and discard according to local regulations. Since the application time is only 1 - 2 hours (depending on temperature) it is advisable to apply the product with 2 persons. Have 1 person begin trimming edges and have another person begin rolling out the floor as specified. Sealed concrete: dripping a small amount of water onto the surface. If the water beads, a sealer is present and paint may not adhere properly. Moisture in the concrete: apply a sheet of plastic (e.g. garbage bag) to the floor. Tape down the edges and allow to set for 24 hours. If water droplets appear on the inside of the plastic or if concrete appears wet (darker in colour), moisture is trapped in the concrete. Loose concrete or concrete dust: if the concrete is loose, chipping or has concrete dust present, the coating will not perform properly unless all loose material and dust is removed and damaged areas are repaired. Floors treated with a levelling mortar or on anhydride floors. 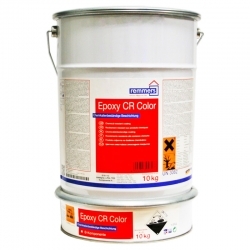 Most epoxies are not UV stable so we would instead recommend Blackfriar Professional High Traffic Floor Paint which will not chalk or fade on the external areas. 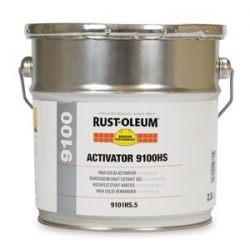 Can Rust-Oleum Maxx be used on a concrete garden patio area? No, for this kind of area we would instead recommend Rust-Oleum Tarmacoat. Question: what is the cure time of the pot life @ 10° C? 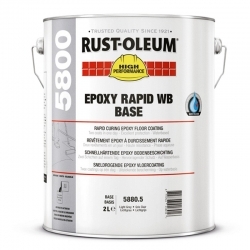 Rust-Oleum 5300 Epoxyshield Maxx should be applied when air (ambient) temperature is 15-35ºC and relative humidity is below 80%. At 15ºC you will have around 2 hours of pot life - full details of induction and application times are listed on page 1 of the TDS (Technical Data Sheet) which can be downloaded from the 'DATASHEETS' tab on the product page. 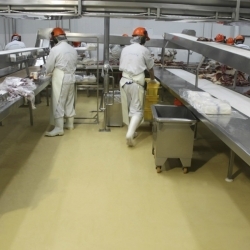 309 Polyurethane Coating is a two pack, solvent-borne, aliphatic polyurethane coating designed as a high gloss finish coat for floors and various other coatings in our range to provide UV resistance, weather protection, hygiene and anti-graffiti properties. Sikafloor 210 PurCem is a multi-component, water-based, coloured polyurethane hybrid screed with self-smoothing properties and a glossy finish. It has an impervious, scratch resistant and smooth surface and is typically installed at 3 - 6mm thickness. 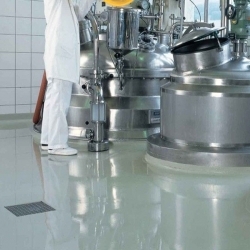 Sikafloor 31 PurCem is a solvent free polyurethane coating for use as a stand alone, high build coating or as a seal coat for covings and details performed with Sikafloor 29 PurCem or other products in the Sikafloor PurCem range. 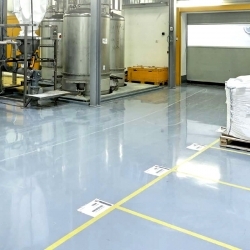 Sikafloor 390 ECF is a two part, electrostatic conductive self-smoothing, flexible, coloured epoxy resin with Crack-bridging and chemical resistance for concrete and screed surfaces in bund areas for the protection against water contaminating liquids.